‘Catalysts for Change’ from Singapore won the Global Final of ‘Social Innovation Relay’ with their job-matching service HopJob, which aims to promote social inclusion and livelihood development (within the community). It does this by tackling unemployment issues, such as imperfect knowledge and skills mismatch. 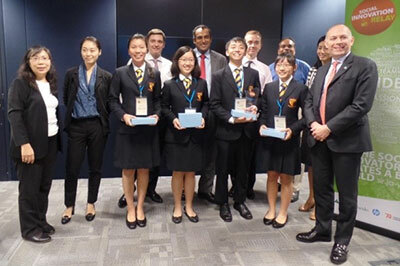 After qualifying in their national country, ‘Catalysts for Change’ competed for the global title against students from 7 countries around the world: Bulgaria, China, India, The Netherlands, Romania, Singapore, and Spain. A JA Europe initiative, the Social Innovation Relay (SIR) is supported by NN Group and works to inspire secondary students to develop innovative business concepts that address social challenges. This year the Social Innovation Relay has engaged over 5,000 students, providing them with essential entrepreneurial competences and social awareness to find success in today’s global markets. "With the SIR we encourage students to embrace social innovation and entrepreneurship to tackle societal challenges. We believe that by doing so they will gain important skills required in any job or business. NN's global partnership with Junior Achievement fits perfectly with the goal of NN Future Matters, our global corporate citizenship programme which aims to help improve people’s financial well-being. As part of this programme we offer our talent, expertise and resources to help provide young people the relevant skills to create economic opportunities, overcome adversity and reach their dreams." – Fleur Hudig, Head Corporate Citizenship NN. The Global Final took place online, with the following Jury: Fleur Hudig (Head Corporate Citizenship, NN Group), Jeanette Weisschuh (Director Economic Progress, Corporate Affairs, HP), Hannah Grainger Clemson (Policy Officer – e-Twinning, School Education, Erasmus+ Exploitation of Results, European Commission), Samuel Lim (Head of Macro Real Money and Official Institutions Sales , Barclays, Singapore), Delfino Eugenio (Project Manager, European Commission – Education Audiovisual and Culture Executive Agency), Anna Yonkova (Head of Marketing, Training and Customer Care, NN Bulgaria), and Vidhya Sampath (Director External Relations Europe, Tata Consultancy Services). Through a mix of online and offline activities, students are able to grow practical business skills and strengthen their social awareness. Together with NN, JA Europe seeks to increase students’ self-confidence, empowering them to get creative and find solutions to both local and global social needs in the following sectors: Education, Health, Social Inclusion, Livelihood Development, and Sustainability. JA Europe (www.jaeurope.org) is Europe’s largest provider of education programmes for entrepreneurship, work readiness and financial literacy, reaching 3.2 million students in 39 countries in 2014. It was founded in 2001 when Young Enterprise Europe and Junior Achievement International Europe merged. JA works with the education and business communities as well as governments to provide young people from primary school to university with experiences that build the skills and competences they will need to succeed in a global economy. JA’s activities have been endorsed as best practice by the European Commission. JA Europe is the European Regional Operating Centre for JA Worldwide®. NN Group is an insurance and investment management company with a strong, predominantly European presence in more than 18 countries. With around 12,000 employees the group offers retirement services, insurance, investments and banking to more than 15 million customers. NN Group includes Nationale-Nederlanden, NN (formerly known as ING Insurance) and NN Investment Partners (formerly known as ING Investment Management). NN Group is listed on Euronext Amsterdam (NN).